Jan 17 (IPS) – Imagine it’s a glorious new era and everything you’ll do as part of your normal day helps to stabilise the climate and the global population, eradicate poverty, and restore the earth’s damaged ecosystems. 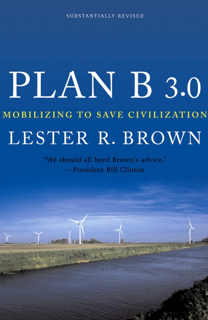 It better not be because that is what it will take to prevent the end of human society as we know it, according to a new book, “Plan B 3.0: Mobilising to Save Civilisation“. The crisis we face is both dire and urgent, requiring a transformative effort like the mobilisation of nations during World War II, says author Lester Brown, president of the Earth Policy Institute, an environmental think tank in Washington. Climate change is happening far faster than scientists predicted and the planet will inevitably experience at least a 2-degree C. rise in global temperatures, putting us firmly into the danger zone, Brown told IPS. That is a far deeper cut than the emission cuts of 25 to 40 percent below 1990 levels over the same time period as called for by the world’s leading climate science body, the Intergovernmental Panel on Climate Change (IPCC). 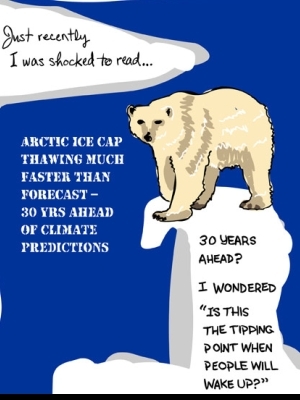 The IPCC based its recommendations on data that is nearly two years out of date, notes Brown. A number of more recent studies and observations — many reported on by IPS — show that climate change is accelerating. Brown is confident that the IPCC will change its recommendation in its next report, but it is not due for another five or six years. “That’s too late when we need to act now,” he said. Plan B 3.0 outlines how emissions could be cut by 80 percent, relying heavily on energy efficiency, renewable energy and expanding the earth’s tree cover. Wind power could produce 40 percent of the world’s energy with the installation of 1.5 million new two-megawatt wind turbines. While that may seem like a lot, 65 million cars are built every year. And there are many mothballed automotive assembly lines in North America and elsewhere that could be converted to produce wind turbines, he says. The state of Texas plans to build 23,000 megawatts of wind-generating capacity — the equivalent of 23 coal-fired power plants and enough electricity to satisfy the residential needs of over 11 million Texans, half the state’s population. Turning to more efficient lighting can reduce world electricity use by 12 percent — enough to close 705 of the world’s 2,370 coal-fired power plants, Brown’s book notes. Retrofitting existing buildings can typically cut energy use by 20-50 percent. In the United States, buildings — commercial and residential — account for close to 40 percent of carbon emissions. The next step, shifting to carbon-free electricity to heat, cool, and light the building, completes the transformation to a zero-carbon emissions construction. Another energy-efficiency measure is changing human “fuel” from a meat-based diet to a plant-based diet because the latter requires about one-fourth as much energy to grow. The reduction in carbon emissions is about the same as that in shifting from a Chevrolet Suburban SUV to a Toyota Prius hybrid car. Brown is highly critical of the use of biofuels, which are made from food grains like corn and soy. Biofuels are driving food prices higher and will result in food shortages which will be disastrous for many of the world’s poor, he says. This part very important: Good reporting, Steve! [While solutions are readily available, what is lacking, Brown says, is awareness that our modern civilisation is at risk and a willingness to take action. Speed is essential, however. Humanity is crossing natural thresholds and triggering feedbacks that may not be reversible, such as the melting of the world’s glaciers and polar regions.